Market to C-level marketing executives from across the corporate and business world with the help of Bookyourdata.com's accurate, human-verified email list. CMOs are powerful points of contact with company-wide influence. Find and contact them with our pre-made directory now. This premium data product is full of those with the job title of chief marketing officer (CMO), not just marketing-related employees. Go straight to the top when you're building strong business-to-business relationships or trying to market your marketing-related products or services. Chief marketing officers often answer directly to the CEO and have the decision-making power to implement sweeping changes throughout an entire organization. With this ready-to-download email database, you can network with people who have the power to change policies, clients, and vendors. CMOs are often considered to be the voice of the customer. If you can help them market their company's products or services, increase brand recognition, analyze sales leads, or more accurately study their audience, then use this CMO email list to let them know. Because we not only provide emails but phone numbers, addresses, and other important data, you will have the tools to really get the conversation started. Find CMOs specifically right now with this specialized mailing list, or feel free to customize your own list of business-to-business (B2B) contacts with our list-builder tool. 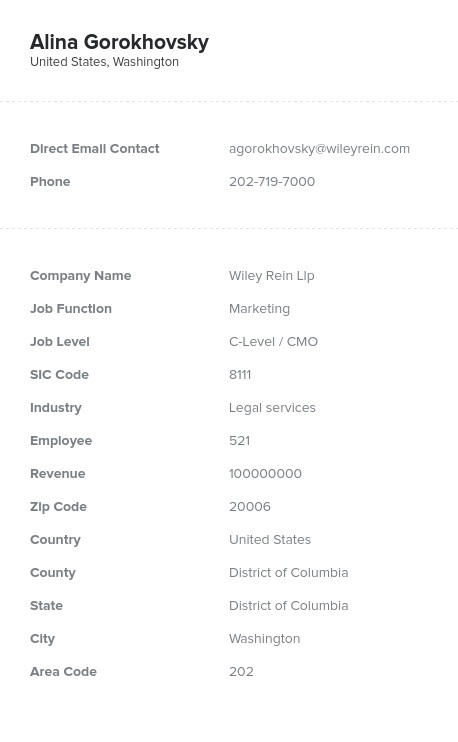 Using accurate contact information from this CMO email list, you can email leads, talk to real decision-makers, mail them important documents, and encourage them to buy your product or use your service. There's a lot of power in being able to reach the right people with the right information, and this CMO mailing list allows you to reach the people in charge of marketing at major companies in the business world. Download this targeted list of CMOs and their key contact information within minutes and get started!